When I was in my mid-twenties, my friend Mark and I used to go trekking deep into the Rocky Mountain wilderness for days at a time. We’d drive out into no man’s land and find entire ranges that were unmarked. There weren’t any beaten trails or signs to guide you safely over a mountain peak or across an alpine river. You were pretty much on your own. There were two things you could rely on up there: your trusty contour map (that was usually pretty accurate, but not always), and the occasional stack of rocks you’d see underfoot – placed there by others who had navigated this route before you. These are called cairns. Sometimes, there would be two or three miles of wilderness between each cairn and you’d have to plod along patiently, keeping a sharp eye out for the next pile to reveal itself to you. If you went too long without seeing one, it was an indicator that you needed to back track to the last marker and re-plot your course. One day, in the middle of a three-day trek through the mysterious San Juan Mountains on the border of New Mexico, I was hit with the realization that these cairns might exist on our spiritual paths as well. You and I know these subtle beacons by a different name – synchronicity. Have you ever experienced it before? You know, when you randomly think of someone you haven’t seen in years and the next day you bump into them at the grocery store? Or when you see the same number several different times in one day and then realize it has some special significance? Or when you pick up the phone to call someone you haven’t spoken with in awhile, and just as you dial them they call you? These all fall into the category of synchronicity, and are usually passed off in our modern world as a mysterious glitch in the matrix. There is no agreed upon scientific explanation to date, so this phenomenon is swept under the rug to be dealt with later. I invite you to consider the possibility that these events could be cosmic signals, purposefully placed to show you that you’re walking in the direction of your life’s purpose. When we are in higher states of consciousness, whether that be deep meditation, shamanic trance, or plant medicine ceremonies, the interconnectedness of all things is one of the first things that becomes evident. But in our everyday lives, this understanding can become clouded by all the hustle and bustle. Synchronicity, to me, is a little tap on the shoulder from the divine, reminding me of my role in this cosmic dance. I’ve noticed that during periods of my life when I’m not in full integrity with my highest purpose, these magical moments become few and far between. Kind of like the vanishing cairns on an outback hike, when you’re headed the wrong way. But as I come back into alignment with my “reason for being”, they begin to show up again all over the place. And the more I acknowledge them, the more frequently they appear. Is it possible that synchronicity is a spiritual breadcrumb on the forest floor of our existence, intended to tell us, “You’re on course! The wind is at your back, and personal truth is straight ahead!”? I’ll let you in on a little secret. 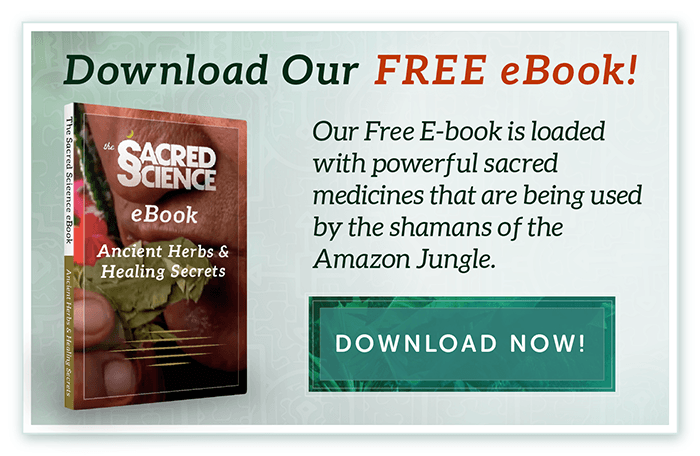 The Sacred Science film came into existence through a series of undeniable synchronicities, beginning with one of the clearest examples I’ve ever experienced. A month after we decided to make a documentary about Amazonian Shamanism, I received three identical phone calls from three different contacts who didn’t know one another. They had heard about our new project and each one told me they knew of a shaman in Peru that I should talk with. It turns out that all three of them were pointing me to the exact same person – Roman Hanis, one of the main shamans featured in The Sacred Science, and now a dear friend of mine. What do you think? Is synchronicity more than just coincidence? If you’ve had a powerful encounter with it lately, please share your story below! Not knowing which stories to share, I just wanted to say that I live by syncronicities always, all ways. There is an expression that I often use when asked how I can have so many syncronicities and to that I reply,”just following my moccassins”. It seems the more I embody (i.e, dance to) Krishna Das’ version of Om Namah Shivaya https://www.youtube.com/watch?v=GdBYx3ayUT8&index=1&list=PLU4A8LsnefqW1cfavLNb10YJGlx02KYSc, thinking of Creator & Destroyer and all that humanity & our planet are going through right now, the more that opportunities show up for me to participate in remodeling and construction projects! Wonderful article, I feel so lost when I am out of synchronicity, and so blessed when I am in sync! I experience all the time! The most outstanding one was when I was on the beach in Gulf Shore AL trying to bring more semblance into my mind, seeking clarity by the ocean always does that for me. I had been involved in a very toxic relationship and three people within hours of themselves came to me unprovoked and invited me to revival in Brownsville, Fl right over the line in Pensacola. After the third invite I made my mind up and went barefooted in my farmer jeans and was greeted by thousands of people who were waiting in line to get in. Once in I went to the standing sideline and was called to the baptismal and was baptized in the Holy Spirit! I completely fell out three large men had to pick me up and lift me out of the baptismal and laid me down with a blanket where according to witnesses watched me engage in “Holy” laughter for about 40 minutes before I came too. It was thee most incredible enlightening experience I ever had…I was literally on “Fire” I could feel the energy for days and couldn’t nor wouldn’t shut up about my experience. I hold this very dear to my heart and know my Lord and God & know no one will ever convince me there is not a God. Hi um my name is jazz, I’m not sure we’re to start but I’ve had these moments all out threw my life and I would be locked into or in sync but then modern life things would pull me away from them. but lately it feels like something is pulling at me very strong so much that the words are just popping into my head. Like tonight I was on my back porch and I heard the words fall. Then I kept hearing the same thing being repeated “bread crumbs from the spirit world” so I took it as something wanted me to fall into my path rather trying to control it like I’ve been trying to my whole life. So I googled the bread crumbs and I’m here now reading this. And yea i believe I know exactly what you mean. well yeah bro, I remember particularly some every beginning of the month lately ago and the amazing thing is I am going back to that same place tomorrow so me seeing this is like a breadcrumb yeah (smile 😊). I am going to share what has been happening to you today, you see when this sync happens I usually meet someone from my past that I have to let go off. It’s a beautiful experience I tell you, because it’s like the universe brings them to me or me to them for the letting go process. It’s wonderful and I am thankful for it. I do have a feeling I won’t be letting go this time tomorrow, I will be letting in. I think this is because I have no one I need to let go right now. I may not be exactly right however, probably there is still more. Whatever it is I know and believe I will be shown. And that’s awesome! Thank you again, It’s you who reminded me of the breadcrumbs in my life today . God bless you. yeah, yesterday turned out alright. Turns out I learnt more about human relationships, now I am smarter. Plus I saw the beautiful number 9 quite frequently. Thanks to the universe for the signs. Life is really interesting. At first I sought spiritual understanding through behavioral modification. This did not work because the one contradicts the other. The body cannot accomplish what the Spirit desires. This left me on a proverbial hamster wheel, chasing my own tail with no hope of realizing my true purpose. Recently, though, I stepped off by giving up some of the unreasonable narratives of others that I unwittingly adopted as my own. leaving battles I couldn’t win anyways has freed my attention and my energy to notice how, why, where and when the Holy Spirit moves. I see things that confirm the path I’m on. I look for cairns along the way. I put up ebenezer stones for myself and others to remember the mystery of the Godspell I serve. I am no longer a slave to fear with missplaced loyalties to other people but, have come into my inheritance as a child of God. He has blazed a path for me to follow out of the forest of forgetfullness where my ancestors have been lost for millenium. On this path, when I’m travelling in spirit and truth, I can actually see the contrails of One who went before me. These are spiritual bread crumbs I follow. An instance that stands out involves a sticker.. The ouraboros symbol appeared on an account I follow on Instagram. However the image was humorous/cartoonish and not the true serpant image. I showed a couple coworkers the silly sticker and continued with my day. Later on that evening I was shopping for a secret santa gift at a bookstore and wondered to the psychology section and a couple books caught my attention.. When I went home to research the author of my newly purchased book, guess what image appeared immediately, the actual ouraboros. And she was quoted in the text above as well.. Marie-Louise Von Franz. A surge of energy and joy overcome me when I follow my heart and open myself to the possibilities.